Having arrived in Pristina two days (2 nights and 1 day) ago, it already felt like we were going on “holiday”, which may have been contributing to the relative good vibes created by a relatively tired gang, some pre-coffee, at 7 AM. In hindsight it is hard to remember what one expects from a place like Mitrovica, having studied its intense history and tensions for a week just before. How separated would it be? How could we tell? Had it not been for the presence of Albanian flags on one side and Serbian on the other, with Putin smiling to us with tight lips from the walls, I am not sure we actually could. Because what does separate a Serb, Serb-Kosovar, Kosovar, Albanian and Albanian-Kosovar? Formulated in various ways I felt this was at heart of the questions we asked that day. 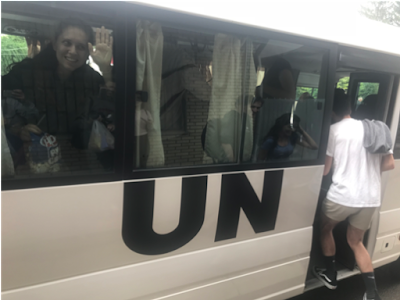 Appropriately arriving in the UN bus, we firstly visited the regional UN office in Mitrovica. In contrast to the shiny quarters of UN I often hear people mention as their “dream-workspace”, the office was not so shiny. How easy it is to forget that all those resolutions, plans, goals and reports you read and cite in your essays are not in theory, there are real people implementing them in practice in real places. I daresay I am not the only one who respected the people we met. I dare also say you can sense it in the room. There we are in a familiar setting, seated with notebooks in front of us. But we are more quiet, we are more hesitant, we yawn smaller and we sneeze lower. Maybe it was because it was the UN, but I think also it is because ultimately you finally meet people who are working with what you have studied and they have real experiences, thoughts and thereby a Kosovo-competency far beyond your knowledge accumulated by way of readings and increasingly challenging questions as we felt more comfortable. The question-hour continued to OSCE, with a slightly fancier outset and even fancier OSCE license plated Porches parked outside. Here I will attempt another dare- in contrast to the UN, the OSCE was slightly more “sterile” no doubt sticking to their neutrality-policy. It did not prevent some implicit jokes about the situation by one of the OSCE representatives, I guess you can allow yourself so if you do it with the politically correct finesse and clear empathy for the situation which he did indeed manage. 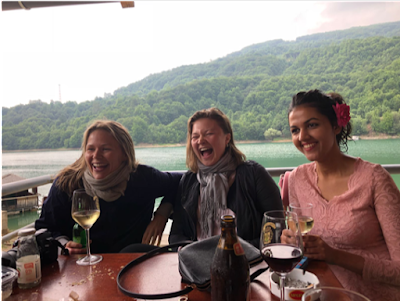 I was not alone in applauding in the form of light laughter as he explained that technically Serbia would consider your entry illegal if you landed at Kosovo airport and received a stamp -as after all you entered Serbia without passing by any legitimate check-point. If the dedication of the employees at the UN and OSCE were surprising, it barely matched the enthusiasm of the students at the Mitrovica Business college which was our third and last stop of the day. Having arguably taken a political step by becoming fully multi-ethnic since September 2017 in the form of having mixed classes, politics was not the most discussed topic. We heard about their co-operation with Europe and the importance of their college up north, and it was impressive. It was a pure reflection of Young Kosovars as the new young Europeans - a business model I after meeting the students hope will work. After all, are we really that different? It is not an easy question, but it gave some food for thought as we drove to the lake and semi-advertised “amazing” dinner place, thereby slowly changing into thought for food. And ah oui- it was sublime! I’ll provide the context: beautiful blue lake amid forested tops/mountains with a long-table outside and a smell of bbq. Nothing tastes much better after a swim(!) in the aforementioned lake, a glass of wine (2/3/ or was it 4? I think Erik ordered an extra bottle in the end) and 2 rounds of playing cards. Also, nothing tastes much better when you are all enjoying it together as the rest of the day. I wondered how it all felt so normal, when after all we are all in a new country taking in new sights, landscape, information and are processing emotions related to that information and coming to grasp with the Kosovo-situation. Well how? because we talk- we swim, we eat, we drive on the bus, we share snacks, we discuss, we experience and we are there- together. How simple and how complex togetherness can be, especially as I was left with perhaps the largest outcome for me that day: Kosovo is very much about “together”. 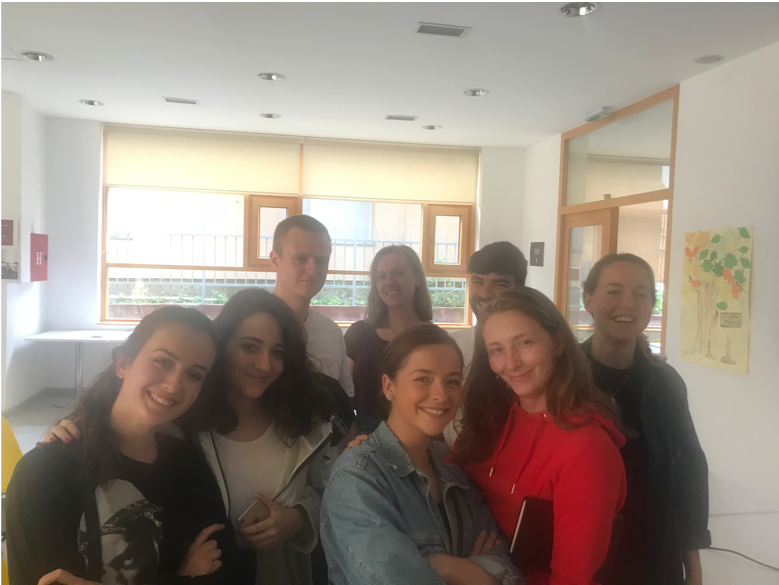 Together with another ethnicity, history and language, learning to live together, being together realising not that much is different, and the future of “together”, together with a Europe, and students as ourselves, who after all are not that different.